Choosing MessageXchange as your Access Point to the eInvoicing network allows you to continue your business as usual, while complying with the new eInvoicing standards. The Australian Digital Business Council’s eInvoicing Interoperability Framework defines the standards by which Australian businesses and Government will adopt eInvoicing. The four corner model stipulates Access Points be used to submit or receive invoices. To comply with the eInvoicing standards, all you need is a connection to our Access Point and we’ll do the rest. We can convert you application’s file to the eInvoicing standard, UBL 2.1. 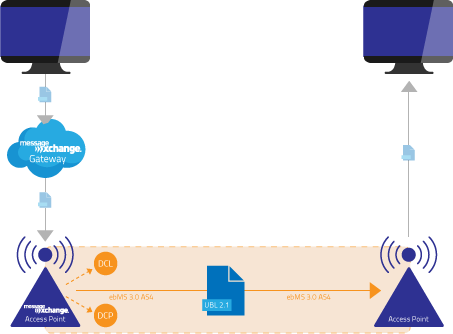 The MessageXchange Access Point will retrieve the recipient’s digital address from the Digital Capability Lookup (DCL) and check they can receive the document, in the Digital Capability Publisher (DCP). We’ll then send it to their digital address, or Access Point, for them to receive. The MessageXchange Access Point can also send eInvoices received through the network directly to your ERP or accounting package via your MessageXchange Gateway. There’s no need for manual data entry or scanning.